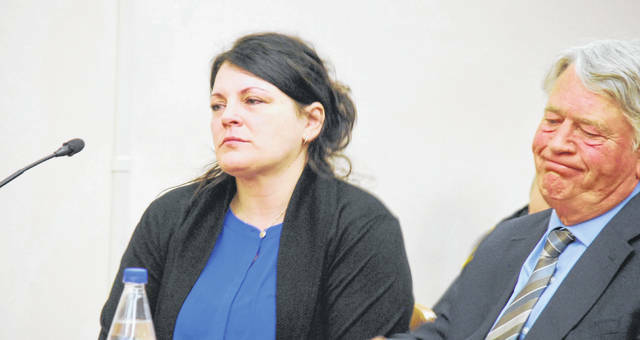 Monica Nystrom, 48, of Bellaire, Michigan, was sentenced Monday to 18 months in prison for driving under the influence of alcohol and pills last August, injurying a family of four Bluffton area residents in a traffic crash near the intersection of Bentley Road and Lincoln Highway in Allen County’s Richland Township. Nystrom told Judge Jeffrey Reed she did not simply decide to drink and drive on Aug. 26, 2018, but was really attempting to end her own life when she struck a vehicle carrying Joel and Teri Steinmetz and their two children, Carter and Tate, ages 8 and 10 at the time. Carter Steinmetz was transported by LifeFlight to Children’s Hospital following the crash, and Tate was transported to the same hospital by EMS. The accident occurred around noon near the intersection of Lincoln Highway and Bentley Road, in the northeastern part of Allen County. Reports from the Ohio State Highway Patrol indicate Nystrom smelled of alcohol and that her eyes were “red and watery” and her responses were “slow and lethargic” at the crash scene. An empty bottle of vodka and a broken prescription bottle for hydrocodone were also found in Nystrom’s car. The Michigan woman was indicted by an Allen County grand jury in October on four counts of aggravated vehicular assault, third-degree felonies, and one misdemeanor count of operating a motor vehicle under the influence of alcohol, a drug of abuse or a combination of both. In a deal struck with prosecutors in March, Nystrom agreed to plead guilty to four counts of vehicular assault, fourth-degree felonies, and the OVI charge. Joel and Teri Steinmetz were in attendance at Monday’s sentencing but chose not to address the court. Immediately prior to handing down his sentence, Reed called the incident a tragedy. In addition to the 18-month prison term, Reed ordered Nystrom’s driving privileges suspended for five years.